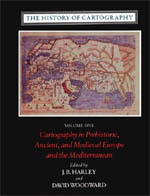 Copyright notice: The History of Cartography is published by the University of Chicago Press. ©1987 The University of Chicago. All rights reserved. This text may be used and shared in accordance with the fair-use provisions of U.S. copyright law, and it may be archived and redistributed in electronic form, provided that this entire notice, including copyright information, is carried and provided that the University of Chicago Press is notified and no fee is charged for access. Archiving, redistribution, or republication of this text on other terms, in any medium, requires the consent of the University of Chicago Press. For information on purchasing the book—from bookstores or here online—please go to the webpage for The History of Cartography, Volume 1.